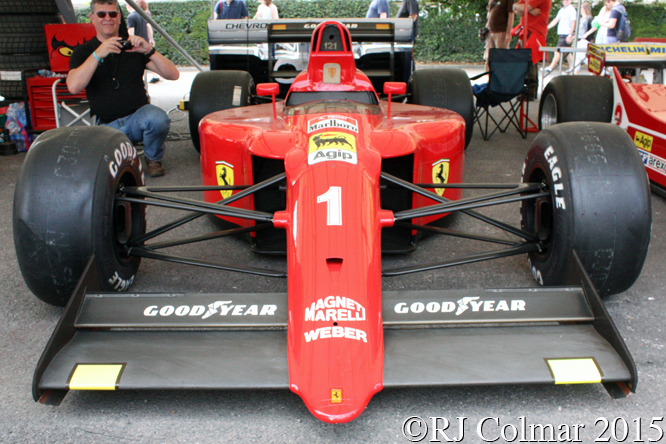 In the final look at Ferarri’s at this years Goodwood Festival of Speed today I’ll be looking at the Formula One cars which covered the 15 year period between 1975 and 1990. In reverse order, Ferrari managed to lure Alan Prost away from McLaren to join Nigel Mansell and drove the Enrique Scalabroni and Steve nichols designed 641 to five victories, to Nigels one, and second place in the World Drivers and Manufacturers Championship after an alleged rival settled the outcome of the drivers championship by deliberately punting Alain into a gravel trap in the first corner on the opening lap of the Japanese Grand Prix. Gilles Villeneuve drove the Ferrari 126 CK chassis #052 seen above to two of the most memorable consecutive Grand Prix victories I have ever seen at the 1981 Monaco and Spanish Grand Prix. … while chassis #042, seen with Rick Hall at the wheel above, was raced twice by Jody and once by Gilles during 1980 and failed to finish on each occasion. One of the highlights of the 1979 season was Gilles epic dice with René Arnoux for 2nd place in the closing stages of the French Grand Prix, Gilles drove the 312 T4 chassis #041 and René the Renault RS10 chassis #RS10/03 both of which are seen above. Finally in forty years ago Niki Lauda finally delivered the World Drivers and Manufacturers championships, for the first time since 1964, ably backed up by Clay Regazzoni driving the Ferrari 312 T, chassis #024 seen above being driven by Rob Hallwas driven to victory by Clay Regazzoni in the 1975 Italian Grand Prix and on it’s final appearance at the 1976 US Grand Prix West. Thanks for joining me on this “Formula One Ferraris” edition of “Gettin’ a li’l psycho on tyres” I hope you will join me again tomorrow when I’ll be looking at the last of a series of Formula Junior open wheelers. Don’t forget to come back now ! 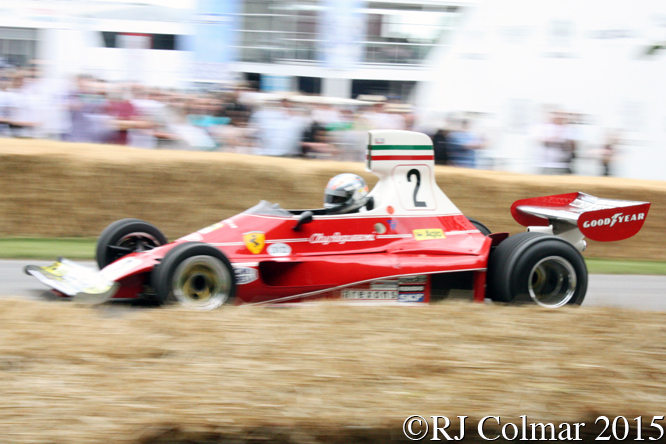 This entry was posted in Uncategorized and tagged 126, 312, 641, Arnoux, C/K, Colmar, Ferrari, Festival of Speed, Goodwood, Hall, Lauda, Mansell, Prost, Psychoontyres, Ralph, Regazzoni, Renault, RS10, Scheckter, T, T4, T5, Villeneuve on July 24, 2015 by Ralph. This entry was posted in Uncategorized and tagged Colmar, GALPOT, Gilles, Italy, Naples, Ralph, Villeneuve on May 11, 2012 by Ralph. 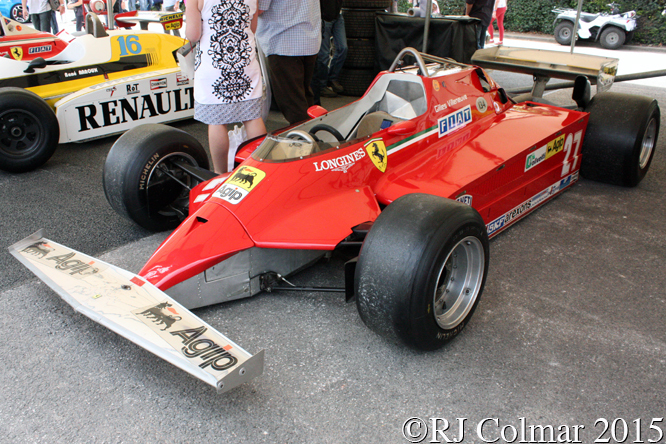 After winning the 1979 World Championship with the cobbled to together Ferrari T4 I looked at last week Ferrari made a decision to change direction, in view of the fact that the recently discovered ground effects which manipulated air passing under the car to create aerodynamic down force with little cost in favored vehicles with narrow motors. 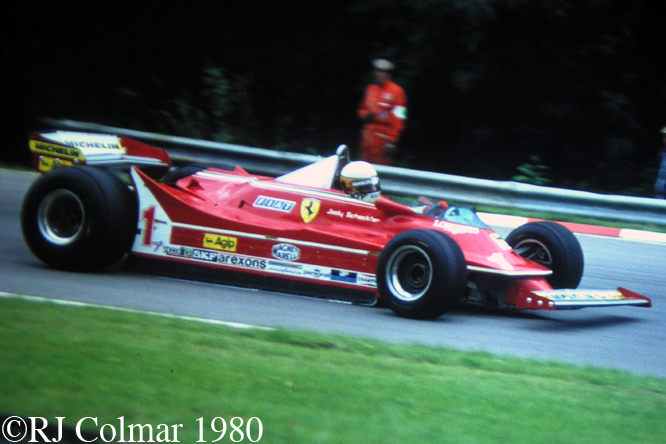 During the 1979 season Ferrari had run with the 180 degree V12 the widest motor in the field and were also running the only transverse gearbox which further compromised the aerodynamics. Ferrari took the decision to build a V6 turbocharged motor but it would not be ready until the 1981 season so in the interim they scaled down the bodywork of the Ferrari T5 in order to try and improve straight line speed which had been lacking in the T4 and also made a narrower version of the 180 degree V12 which had dire consequences on hitherto rock solid reliability. Jody Scheckter, who by his own admission had already achieved his goal in 1979 and decided to retire at the end of 1980 had a simply dire year trying to defend his championship scoring just two points in Long Beach and failing to even qualify for his last but one Grand Prix in Canada completely. 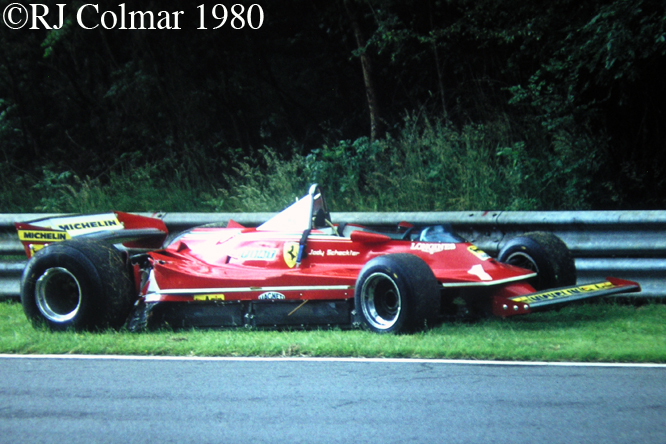 The #1 seen in both photo’s above during practice for the 1980 British Grand Prix is chassis #044 which was mostly taken to races as a spare car in the 1980 season both Jody Scheckter and Gilles Villeneuve raced the car with Gilles scoring the chassis best finish a 5th place in Canada. Gilles Villeneuve managed to score a total of six points in 1980, the eight points total scored by Ferrari equaled a tenth place finish in the Championship, an all time low scoring only on point more in 14 races than in the 11 race in 1969 season when they finished 6th in the championship. 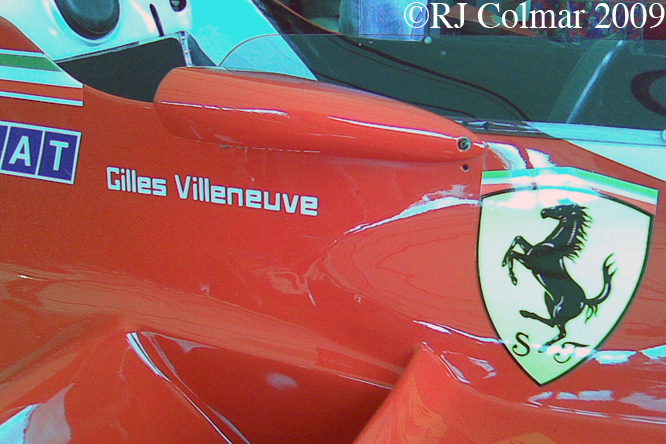 The chassis above is #045 in which Gilles scored a best 5th place in Monaco and a further 6th place in Belgium. At the 1980 Canadian GP Gilles Villeneuve took the first attempt to start in #045 above but was involved in a first corner meleé which eliminated seven cars from the race. He then jumped in to chassis #044, which Jody crashed at during practice for the British Grand Prix, see middle photo and came home 5th. Thanks for joining me on the ‘Annus Horribilis’ edition of ‘Gettin’ a li’l psycho on tyres’, I hope you will join me again tomorrow. Don’t forget to come back now ! This entry was posted in Uncategorized and tagged 312, Brands, Colmar, Ferrari, Foghieri, GALPOT, Hatch, Ralph, Scheckter, T5, Villeneuve on February 24, 2012 by Ralph. Regular readers who go back to my days posting stories about cars at rowdy.com may remember seeing today’s photo’s before, however since my original post is long lost to the infosphere and I have found out a little more about this particular car I will ask your indulgence a second time. The Ferrari 312 T3 was the third evolution of the Ferrari Grand Prix cars built to Formula One regulations with a 3 liter / 183 cui 180 degree V12 motor and transverse gearbox built for the 1978 World Drivers and Constructors Championships which had been won for a second time in 1977 by Niki Lauda who moved onto the Brabham Team for ’78. 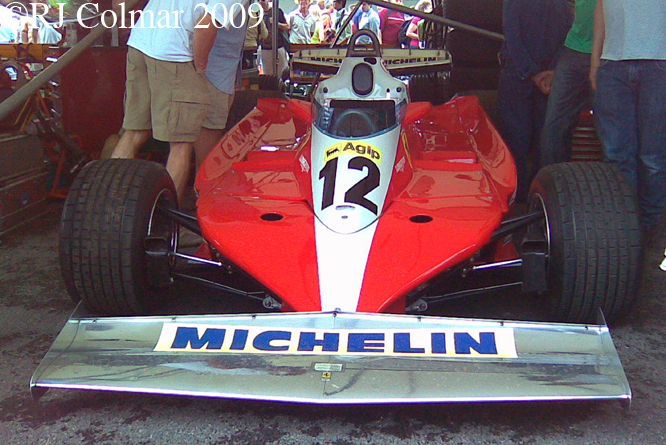 Argentinian Carlos Reutemann and Canadian young gun Gilles Villeneuve were to drive for the Ferrari team in 1978 and despite the car being completely outclassed by the revolutionary Lotus 79 ground effects car the superior reliability of the Ferrari 312 T3 managed to secure second place in the Constructors Championship for Ferrari picking up 4 wins to the eight scored by the Lotus team. 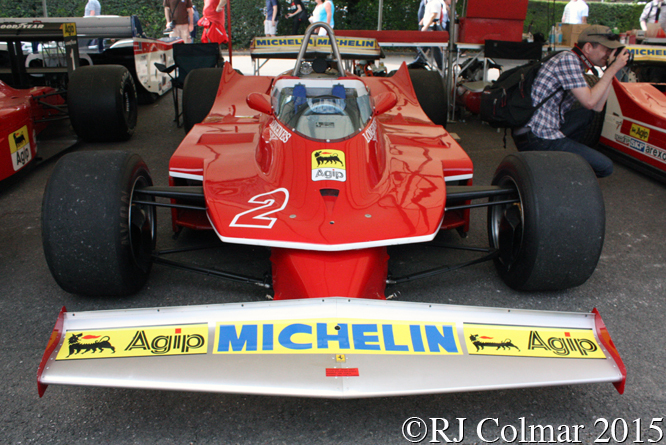 This particular car, chassis #034, was used exclusively by Gilles Villeneuve in 1978 and for one race in 1979, the most important of which was the 1978 Canadian Grand Prix which marked Gilles first Grand Prix victory. This car was acquired by Mr N.Mason in the mid 1980’s and has been a regular guest at the Goodwood Festival of Speed, where the car is seen here, ever since. Thanks for joining me on this ‘Allez ! 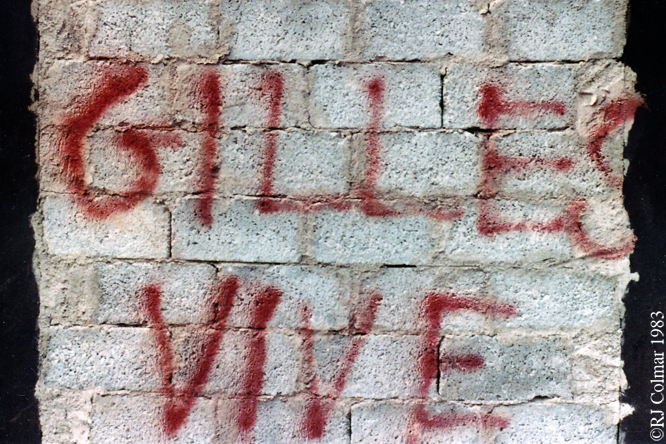 Allez ! Allez ! Gilles !’ edition of ‘Gettin’ a li’l psycho on tyres’, I hope you will join me again tomorrow. Don’t forget to come back now ! 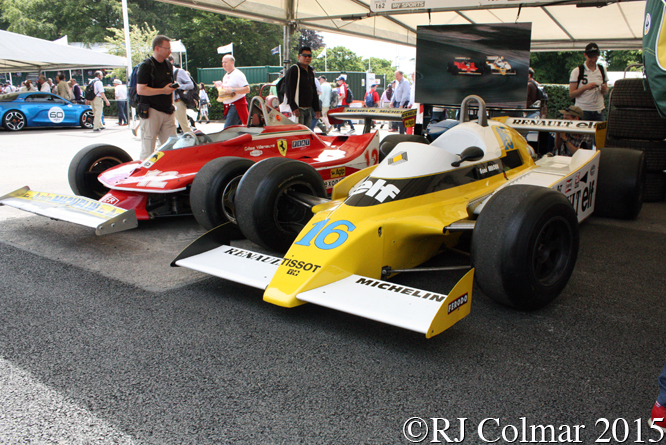 This entry was posted in Uncategorized and tagged 312 T3, Colmar, Ferrrari, GALPOT, Goodwood, Mason, Ralph, Reutemann, Villeneuve on February 10, 2012 by Ralph. One of the amazing things about the internet is the way it brings people together regardless of physical or geographic location, a case in point cropped up last year when I was looking for a photograph of McLaren drivers Denny Hulme and Peter Revson for an ongoing documentary project and found exactly what I was looking for on the Automobiliart blog run by Paul Chenard. I e-mailed Paul and he kindly put me in touch with the owner of said photograph and thanks to our shared interest in motor racing and Gilles Villeneuve in particular Paul and I have remained in touch ever since. 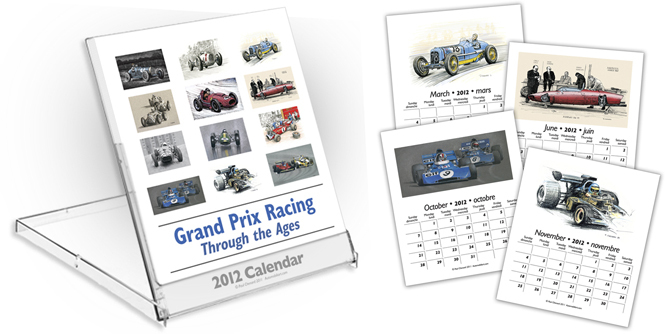 Paul, who hails from Nova Scotia, trained as a graphic designer and in the 1980’s he engaged his passion for the history of Grand Prix and Sports/GT racing by collecting vintage toy racing cars, books and reference material on racing history. 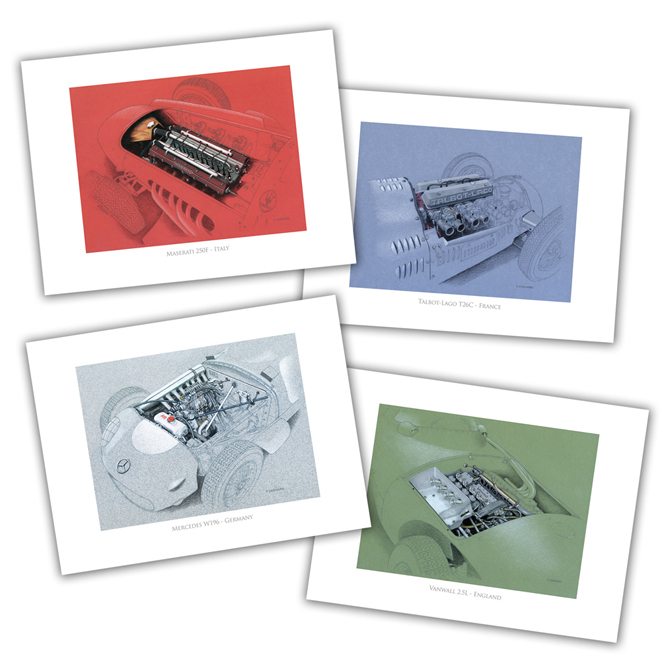 In 2007 Paul decided to combine his professional work with his interest in motor racing and set up Automobiliart.com to market his works which are made using a variety of media. Unusually, and this is why I like Paul’s work, he captures the “feeling” I get when spectating at races and looking at racing cars so well I can almost smell them. 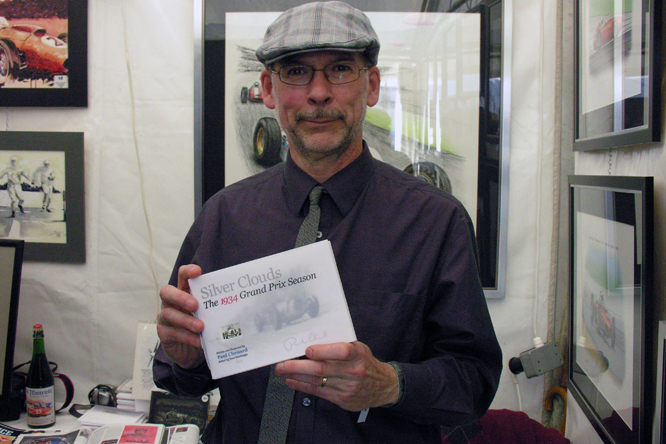 In September I had the opportunity to meet Paul at Goodwood, above he can be seen promoting his entertaining “Silver Clouds: 1934 Grand Prix Season” limited edition 40 page hand assembled book, designed written & illustrated by Paul, a book Mercedes Benz thought so good they ordered two, of the only 50 copies to be printed, for their museum. 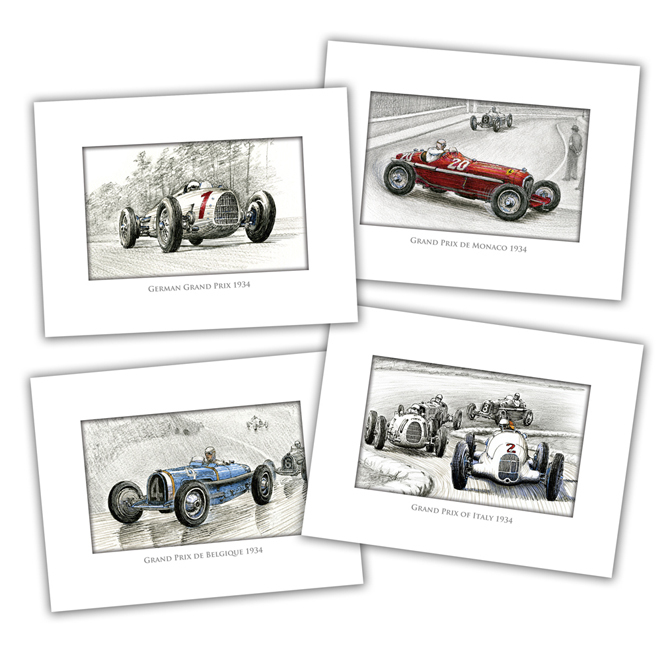 You can find a fine selection of more of Pauls work, which make excellent seasonal gifts, on this link to the Automobiliart.com website. 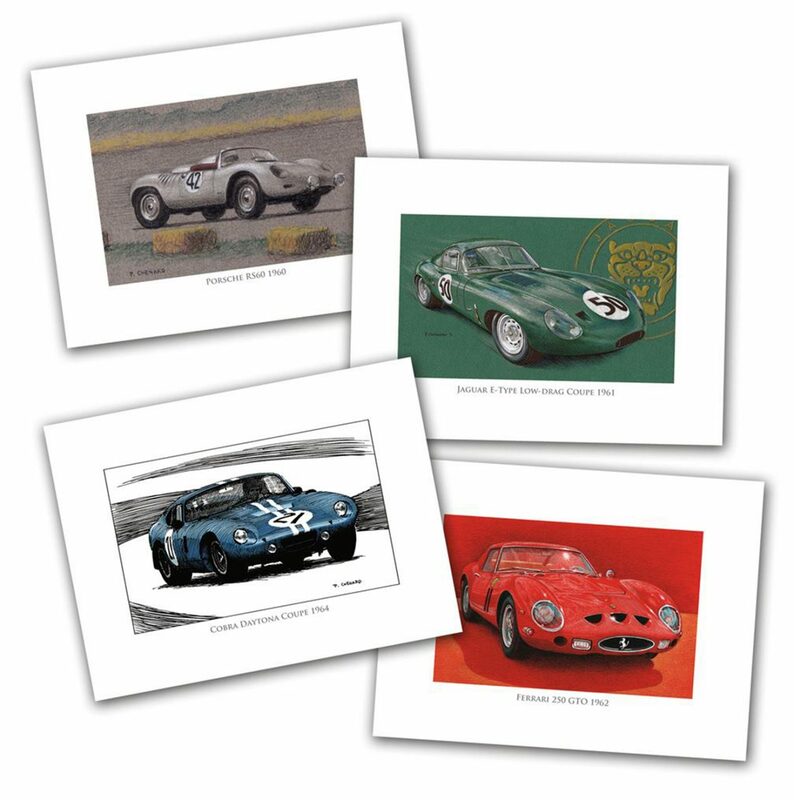 Last week I mentioned to Paul that I was compiling questions for a seasonal quiz and he has kindly agreed to donate one of these sets of blank greetings cards to the winner of the Automobiliart GALPOT Seasonal Quiz which will be running from December 26th to January 2nd. 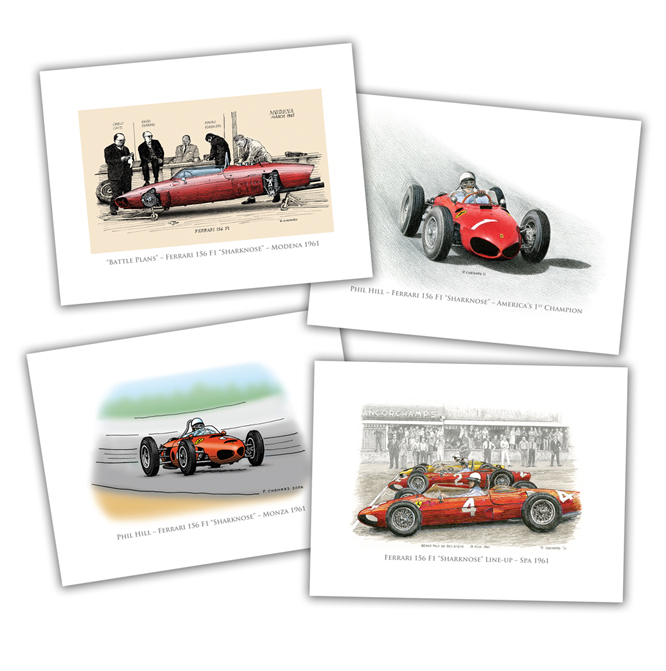 The cards, which measure 15.24cm x 11.43cm, come in packs of 12 with 3 copies of 4 designs in each set, plus A6 envelopes. 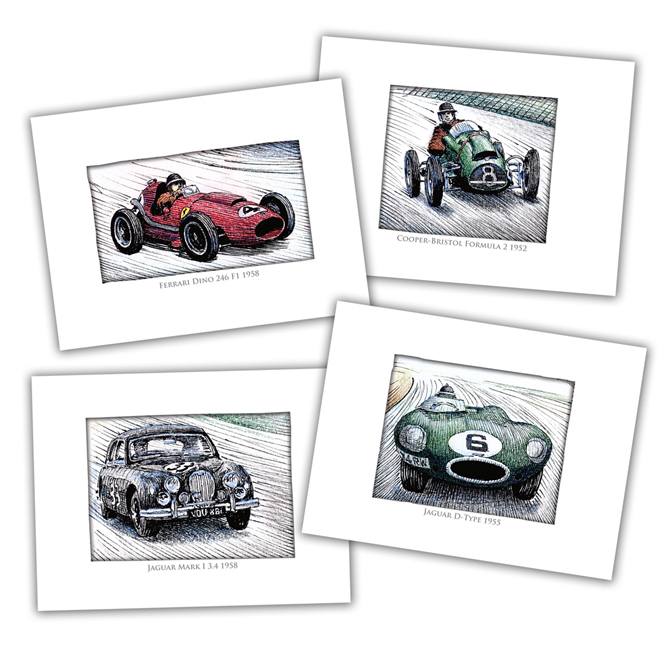 Mike Hawthorn’s Race Cars sets. Full details of the Automobiliart GALPOT Seasonal Quiz will be announced with the first questions on December 26th. Thanks for joining me on this Automobiliart edition of “Getting’ a li’l psycho on tyres” I hope you will join me again tomorrow. Don’t forget to come back now ! This entry was posted in Uncategorized and tagged 1934, Automobiliart, Cevert, Colmar, GALPOT, Goodwood, Hawthorn, maserati, Nuvolari, Paul Chenard, Ralph, Sharknose, Sportscars, Villeneuve on December 1, 2011 by Ralph. The Ford Cosworth DFV powered McLaren M23 was designed by Gordon Cuppock, based on the lessons learned from the successful McLaren M16 Indy car. The M23 driven by Denny Hulme burst onto the Grand Prix scene in 1973 with a pole position on its debut in South Africa. Denny scored the first win for the model in Sweden and Peter Revson followed that with wins in Great Britain and Canada in 1973. For 1974 Denny who won his last race in an M23 in the season opening Argentinian GP was joined in the McLaren team by 1972 World Champion Emerson Fittipaldi who won in Brazil, Belgium, and Canada on his way to becoming the 1974 World Champion. McLaren also won the World Constructors title in 1974. Jochen Mass joined Emerson in the McLaren team in 1975 winning the shortened Spanish GP while Emerson won in Argentina and Great Britain to finish 2nd in the World Drivers Championship. 1976 would prove to be the chassis most successful year in terms of wins with James Hunt, who replaced Emerson in the team crossing the line first in Spain, France, Great Britain, Germany, The Netherlands, Canada and the United States. However 1976 was a year of high drama and comedy in Formula One first James was disqualified from the Spanish Grand Prix because his car was 1.8cm less than an inch too wide. In 1975 the McLaren had been used as a base model too set the dimensions for the 1976 Formula regulations. McLaren successfully argued that when the tyres on the car were moving they were taller as a result of the centrifugal force taking up the slack on the side walls of the tyres and that this accounted for the discrepancy. The governing F.I.A. accepted this argument and the win was reinstated with a $3,000 fine, when the M23’s next appeared they had a slightly narrower rear track. On the first corner, Paddock Bend, of the opening lap of the British Grand Prix James Hunt was the innocent victim in a crash with Ferrari’s Clay Reggazoni. The race was stopped and James who’s car was severely damaged took a short cut to get back to the pits when the race was stopped. Come the restart the organisers initially refused to allow James to line up on the grid because the team had worked to repair his car while the mess was being cleared up. However people power intervened and fearing a riot from the partisan crowd the organisers relented, James took the win, he and the partisan crowd partied long and hard into the night and later the F.I.A. disqualified both Hunt and Clay Regazzoni from the event for having failed to complete the opening lap. Up until this point reigning Champion Niki Lauda had dominated the 1976 Championship with four wins three seconds, the last of which became 1st after Hunt’s disqualification from the British GP and a third. 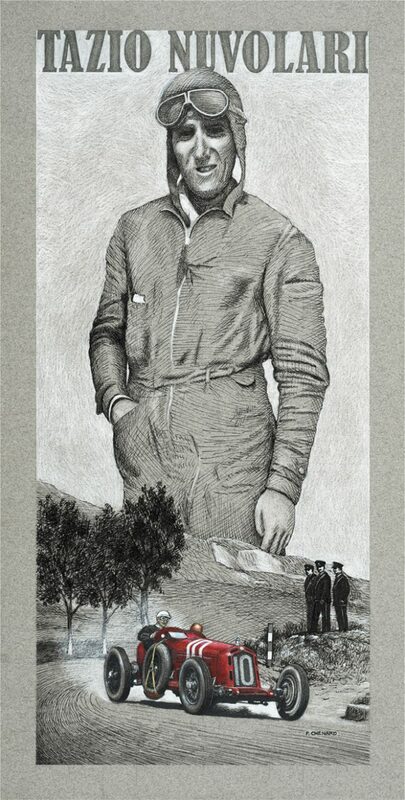 The next race was the ill feted German Grand Prix in which Niki was eliminated in an accident that triggered an inferno from which he was lucky to escape with his life. James won the German Grand Prix and the Dutch GP while Niki recuperated and 39 days after the inferno at the Nurburgring Niki and James met again at the Italian GP. At the end of practice for the Italian GP James and Mclaren team mate Jochen Mass and John Watson at Penske were found to be running with a fuel octane rating that was too high and had their Saturday times disallowed. Since it had been raining during the first practice sessions on the Friday Hunt, Mass and Watson had effectively failed to qualify, however the 13 second plus off pace Otto Stuppacher was already on his way home to Austria when the announcement and the Marlboro sponsored Art Mezario withdrew as did Englishman Guy Edwards allowing Hunt, Mass and Watson to start. Hunt crashed trying to make time and was applauded for doing so by the Tifosi and Lauda came home a remarkable 4th in his first race back. James won both the Canadian and US Grand Prix while the brave Niki could only amass a further three championship points. 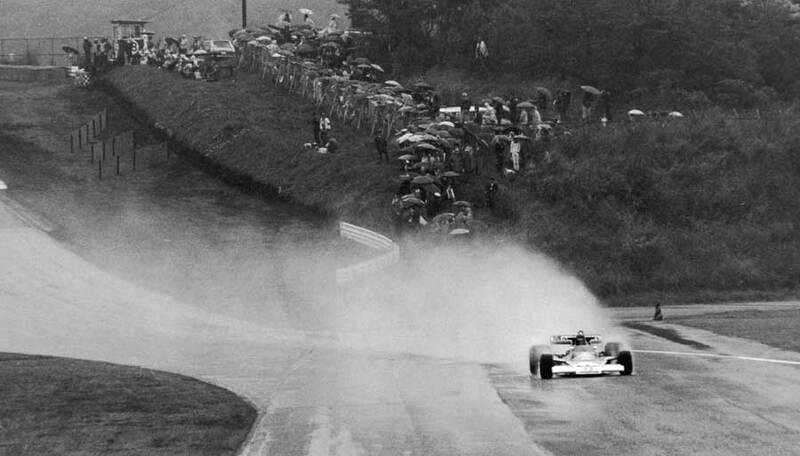 Going into he last race of the season the Japanese GP Niki had a 3 point lead over James. For the race James qualified 2nd behind Andretti with Niki just one place further back. I remember getting up at some unholy hour to watch this race live on TV in the UK and remember the disappointment when I saw the monsoon that unfolded on the track. After much debate amongst the driver the race started and Niki who had lost his eyelids in the German inferno and yet to have them replaced through plastic surgery had little choice but to retire in the near zero visibility conditions. James took an early lead in the race but as the rain stopped and the track started to dry Hunt started losing ground dropping to 5th after a pit stop to replace a punctured tyre with just a few laps to go. James charged back into the race managing to regain two positions which left him in third position when the flag came out for Mario Andretti to win by just over a lap from Patrick Depailler, with James Hunt, who had no idea what his position was in the race, right on his tail. Hunt only learned that he had become champion after he got out of the car and stopped shouting at team manager Teddy Meyer for a less than perfect pit stop. Hunt won the 1976 World Drivers title by just one point and Great Britain had it’s first World Champion since Jackie Stewart had won his last crown in 1973. The McLaren M23 was pressed into service again in 1977 but its competitiveness was on the wane James winning a non championship race before committing fully to the M26 successor which had gone through a troublesome one year gestation period before coming on song. The works M23 had a final swan song when it introduced Gilles Villeneuve to the world of Grand Prix racing in Great Britain and Bruno Jack’O’Malley in Italy towards the end of the 1977. 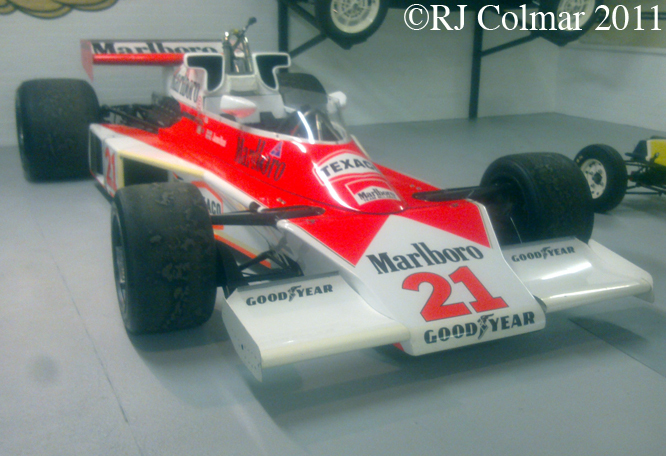 I have done my best to find out exactly which of the 13 M23 chassis this is, The Donington Museum blurb identified this car as McLaren M23/8 and said it was used to win the ’76 Spanish and US GP’s however M23/8 was destroyed in 1975. The car was then given a new tub with the chassis number M23/8-2 and the old tub was apparently eventually repaired to 1975 tall airbox spec and now resides in the United States. M23/8-2 went on to become one of the stars of the 1976 season being used to win the controversial Spanish GP along with those in Canada and the US GP. M23/8-2 is said to belong to BCE the man responsible for running the the whole Formula Show since 1981. Most likely the vehicle above seen at the Donington Park Museum is M23/6 which seems to meet many of the criteria hinted at on various threads of The Nostalgia Forum and who’s whereabouts is listed as unknown by the respected Old Racing Car site. M23/6 was used by Denny Hulme to win the Agentine Grand Prix in 1974 then in 1976 James Hunt drove it to win the French Grand Prix, cross the line first in Great Britain only to be disqualified . At the next race the German Grand Prix I saw James win in this chassis which became one of a rare set of vehicles that crossed the line first in three consecutive races, though it was disqualified from one of them. In 1977 Emilio de Villota drove M23/6 with little success in Grand Prix events, 2 starts three DNQ’s, but did win two rounds of a British series open to all single seat racing cars. My thanks to Michael Ferner, Wouter Melissen, Steve Holter, Simon Hadfield, Slurp1955, at The Nostalgia Forum for their valuable contributions to todays blog. Hope you have enjoyed today’s 1976 edition of ‘Gettin’ a lil psycho on tyres’ and that you will join me again tomorrow. Don’t forget to come back now ! This entry was posted in Uncategorized and tagged Art, Coppock, Denny, DFV, Emerson, Fittipaldi, GALPOT, Gilles, Gordon, Hulme, Hunt, James, Jochen, M23, Mass, McLaren, Peter, Revson, Tidesco, Villeneuve on July 18, 2011 by psychoontyres. Taking a one day break from GALPOT’s Indy 500 celebrations, for Ferrari Friday today we are celebrating the life of Gilles Villeneuve, father of 1995 Indy 500 winner and 1998 World Champion Jaques Villeneuve, and Gilles Ferrari 126 CK seen here during practice for the 1981 British GP at Silverstone. 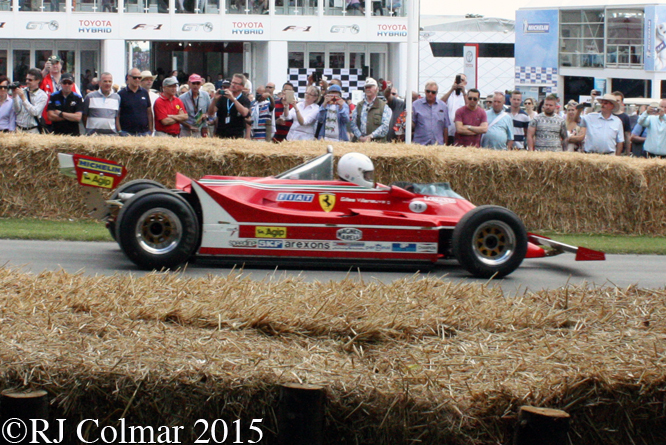 The Ferrari 126 CK was a development of Ferrari’s first turbocharged Grand Prix car which was launched in 1980. Featuring a fire breathing 600 hp 1,496 cc / 91 cui 120º V6 twin turbo charged motor and six speed gearbox Villeneuve described this car as a ‘big red Cadillac’ because the chronic turbo lag, ferocious power curve combined with ground effect aerodynamics made this car a real handful to keep under control. Despite it’s wayward characteristics Gilles pulled off two of the most entertaining victories this writer has ever seen on TV, the first at Monaco (apologies commentary in German) came after Champion elect Nelson Piquet spun off after leading for 51 laps and reigning Champion Alan Jones experienced a fuel feed problem which allowed Gilles to steal a late victory on the one circuit least suited to his cars few strengths. 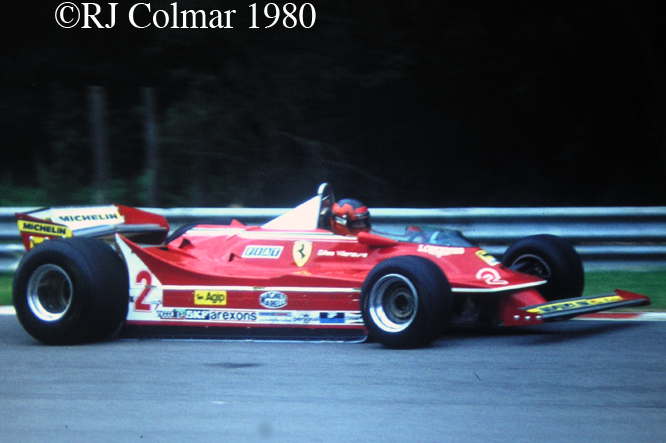 Two weeks later Gilles pulled off an even more unlikely victory at the equally tight and unsuited Jarama Circuit this time Villeneuve took the lead after 14 laps when reigning Champion Jones spun off. Gilles kept a four car train behind him for the rest of this exciting race by using the Ferrari’s brutal power on the straights to pull away out of the corners, going round the corners his pursuers bunched up time after time but did not have the brute strength to get an edge on the straights. The finish of the 1981 Spanish Grand Prix was one of the closest in history with the first five cars being separated by 1.24 seconds. Sadly this would be the last time Gilles would take the checkered flag. 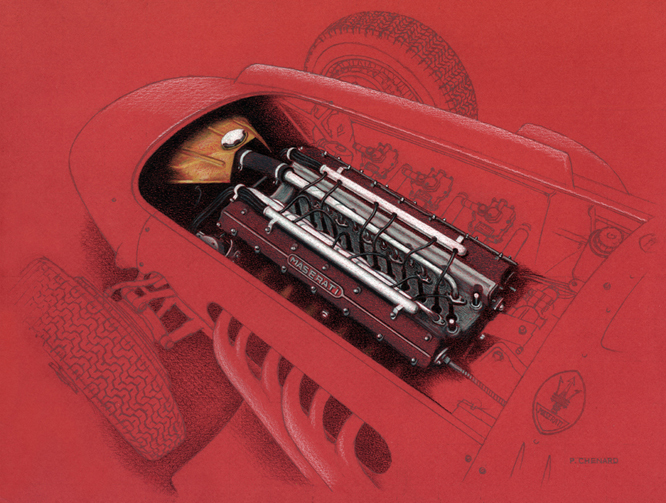 By the time Ferrari arrived in Britain they were developing a way to minimise turbo lag by injecting fuel into the red hot turbo exhaust pipe when the throttle was off, as the fuel ignited in the turbo exhaust pipe the pressure difference created between the burning fuel in the exhaust and the turbine wheel mounted upstream caused the turbine wheel to spin faster which in turn increased the turbo boost to the motor so that when the throttle was depressed more power was readily available. In this form whenever the 126 CK was off throttle a lick of flame would appear out of the exhausts. At some point this system was banned, it being successfully argued by teams using naturally aspirated motors that the turbo afterburner constituted a second engine, when the rules clearly stated only one motor was allowed. 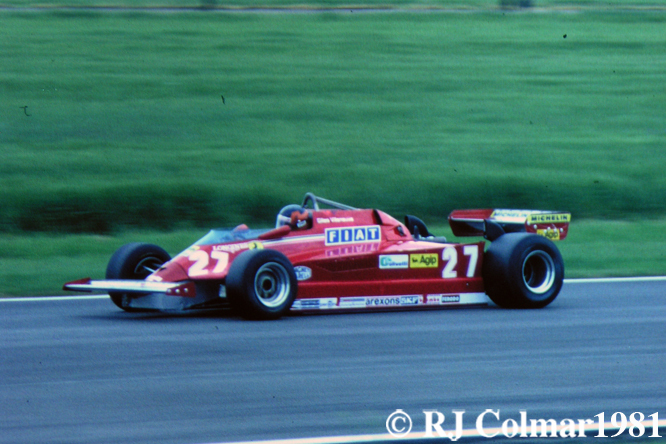 At the British Grand Prix, apologies Austrian commnetary, Gilles qualified 8th and made up five places on the opening lap before loosing it on the apex of the last corner of the first lap. Notice in the clip that despite his totaled car Gilles somehow manages to squeeze another 1/4 lap out of the car before retiring, this guy just did not know how to stop when the chips were down. Another memorable performance that emphasised Gilles never say die attitude came at the 1981 Canadian Grand Prix where despite his damaged front wing obscuring his vision and adversely affecting the already poor handing of his Ferrari for numerous laps, Gilles kept his car on the black stuff to record an amazing third place finish. Hope you will join me for another edition of ‘Gettin’ a lil’ psycho on tyres’ tomorrow. Don’t forget to come back now ! 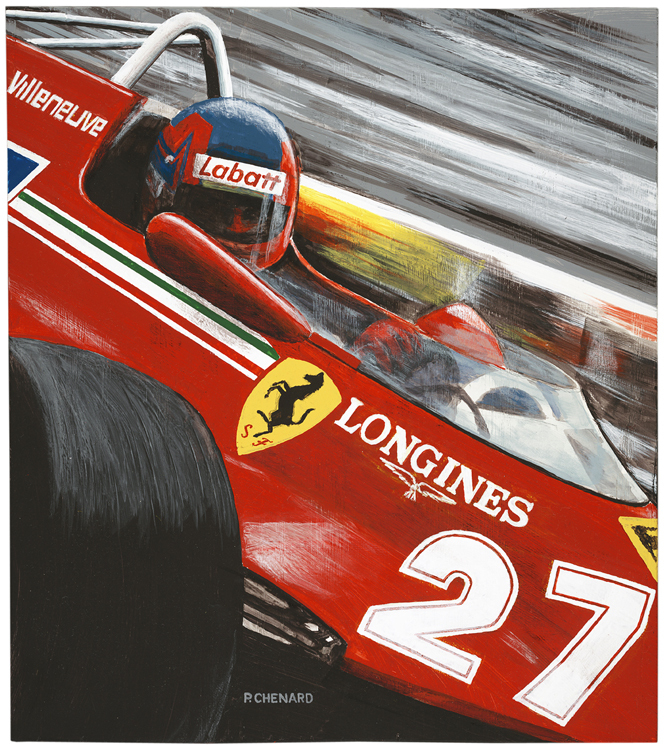 This entry was posted in Uncategorized and tagged 126 CK, 1981, Art, Canada, Ferrari, GALPOT, Gilles, Grand, Jarama, Monaco, Prix, Spain, Tidesco, Villeneuve on May 13, 2011 by psychoontyres.